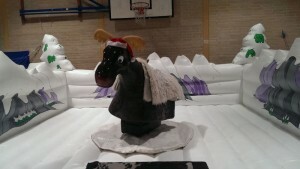 Bizzy bouncers not only specialise in inflatables but we also have our rodeo bull that we hire out for birthday parties, fetes and weddings. They provide so much fun for adults and children and will keep your guest amused even if they do not want to participate themselves. They have become very popular at stag night and hen parties too providing lots of fun for the bride and groom to be along with their bridal party. If you would like to hire our rodeo bull then we will send one of our friendly member of staff to work the bull for you so you can join in with the fun. Riding Rodeo is the ultimate in bucking bronco hire and we can offer customers in Essex the most enjoyable and brilliant experience ever. Your guests will love taking part and once the party gets going nobody will want to miss out. Bizzy Bouncers use only the best quality hire products. We have the most comprehensive public liability insurance cover that keeps our customers safe, including your children so that they can have a ride too (from the age of 5 years). Our rodeo bulls are a fantastic way to get the party started and will keep your guests entertained throughout your day or evening. We offer the most superior 1st class hire service in Essex and will of course serve the surrounding areas including Kent and London. Bizzy Bouncers are proud to say we have over 20 bucking bronco rides as well as themed rodeo hire and we can brand in terms with corporate hire too. We will provide you with uniformed and fancy dressed operators so that you can enjoy over 20 different rides with people dressed to suit your own theme. You can also combine the rodeo with our inflatables making the experience even more fun. Our events team will make sure that we tailor your hire requirements so that your function, party or other event offer your guests a fantastic, memorable time.